It is common to believe that if you have an estate plan — including a will, power of attorney, and perhaps a basic revocable living trust — that you have done all you can to protect your assets. But what will happen if you have a stroke, are diagnosed with Alzheimer’s disease, or suffer some other health event that means you must go into a nursing home? Will everything you have saved be needed to pay those costs? We encourage you to contact us to talk about asset protection strategies that address these situations. 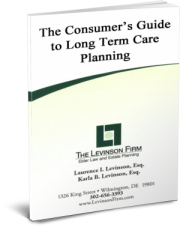 At the Wilmington, Delaware, elder law firm, The Levinson Firm, LLC led by experienced attorney Karla Levinson, applies numerous strategies to prevent your assets from being consumed should you ever need to enter a nursing home or require long-term care. Long-term care insurance is an option for some, but beyond the means of others — and you may pay for coverage but never use it. Further, you may have heard horror stories about inadequate payments, refusals to pay and expiration of coverage. One valuable service we provide is Medicaid planning. This means taking conscious, practical and legal steps to ensure you will qualify for Medicaid to pay for nursing home care if and when you need it. There is nothing shifty or dishonest about Medicaid planning. In fact, there are strong similarities between basic estate and tax planning and Medicaid planning. Most people want to keep their hard-earned property and pass as much as possible on to their heirs. Most importantly, Medicaid planning allows you to keep your hard-earned property for YOUR NEEDS above and beyond what Medicaid provides. If you are able to plan ahead, there is a specific type of trust that can help secure your Medicaid eligibility without giving up control of your assets. Other solutions offer asset protection if you are facing a crisis or believe your planning horizon is less than five years. Please contact us to discuss an asset protection plan suited to your circumstances and goals. Our lawyers have extensive estate planning knowledge, enabling us to make sure your overall asset protection “road map” is legal and comprehensive.